The primary objective of the Graduate Program in Prosthodontics, through an organized, advanced and comprehensive curriculum, is to prepare dentists for the contemporary specialty practice of Prosthodontics. The program is designed to produce clinicians proficient in a range of procedures characteristic of the discipline. By integrating courses in behavioral and biological disciplines, in additional to clinical experience, graduates will also become competent at research and teaching. Clinic and research facilities are housed primarily in the School of Dentistry which is located in the Health Sciences Center of the University of Louisville. The Kornhauser Health Sciences Library is a common facility shared by all components of the Center. It houses a collection of more than 250,000 volumes and 1200 current periodicals, as well as offering a wide variety of library support services. The Graduate Program in Prosthodontics is accredited by The Commission on Dental Accreditation of the American Dental Association, a specialized accrediting body recognized by the Council on Postsecondary Accreditation and by the United States Department of Education. View all School of Dentistry accreditation information. The program begins on July 1, and continues through 36 calendar months. The program is designed to fulfill the requirements of the American Board of Prosthodontics for a certificate in prosthodontics, along with the requirements of the University of Louisville Graduate School for a Master of Science in Oral Biology. The curriculum is integrated so that both the certificate and the Master of Science will be awarded simultaneously upon completion of requirements. Didactic, clinical, teaching and research experience are spread throughout the program. The University of Louisville has a total enrollment of more than 23,000 students of whom approximately 5,900 are in Graduate School. Founded in 1798 as Jefferson Seminary and later known as Louisville College, it became the University of Louisville, in 1846 and joined the state university system in 1970. The Graduate School was established in 1907. The Health Sciences Center, composed of the School of Dentistry, School of Medicine, School of Nursing, Kornhauser Library, University Hospital, Ambulatory Care Center, and the Brown Cancer Center, share a twelve block area with several other health care facilities. Louisville is Kentucky's largest city, with a population of over 1,000,000 in the greater Louisville area. Louisville has long been known for traditional landmarks such as Churchill Downs, the site of the Kentucky Derby, and the Belle of Louisville, the city's historical sternwell riverboat. Cultural activities are plentiful, including Actor's Theater, the Louisville Orchestra, the Louisville Ballet, the Kentucky Opera Association, the J.B. Speed Art Museum, the Museum of Natural History, and the Museum of Science and Technology. Sporting events include horse racing at Churchill Downs, minor league baseball with the Louisville Bats, and collegiate sports, featuring one of the nation's finest basketball teams. Families will also enjoy touring the Louisville Zoo. If you have more than three letters of recommendation, please submit those via mail as well. The application and all supporting documents should be submitted by September 1 prior to the year you wish to enter. Official Course-by-Course Evaluation Report from ECE (Educational Credential Evaluators, Inc.), P. O. Box 514070, Milwaukee, Wisconsin 53203-3470-USA - http://www.ece.org. National Board scores are preferred but not required. If there is an equivalent exam from the country of origin, that may be acceptable. Tuition/fees for 2019-2020 are approximately $18,326 for in-state and $30,568 for out-of-state students. A $100 non-refundable fee is required upon acceptance into the program. This fee will be applied to tuition upon matriculation. More information on financial aid can be found on the School of Dentistry's Financial Aid site. Unlike many urban areas, Louisville offers a variety of both pleasant and affordable housing. Moderately priced student dormitories and apartments are available on the Health Sciences Campus renting for $600-800 per month. Rental properties are available in nearby neighborhoods for $600 per month and higher. 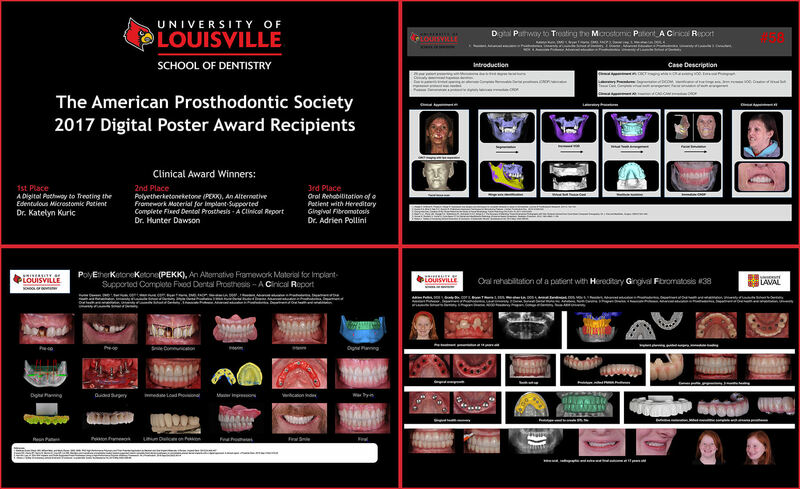 A special congratulations to our very own Prosthodontists, Dr. Katelyn Kuric, Dr. Hunter Dawson, and Dr. Adrien Pollini for placing 1st, 2nd and 3rd place in The American Prosthodontic Society 2017 Digital Poster competition! Read the full story here. If English is your second language, you are required to take the TOEFL exam. You must register for MATCH as we are a participating program with PASS. We will NOT accept an emailed 2x2 photo. We only accept a 2x2 passport-sized photo via mail. You must write your first and last name on the back of the photo. We will accept the $25 application fee only via check or money order. You may NOT pay this online or via credit card. WE DO NOT ACCEPT CASH. You will need to send the cashier’s check before we will be able to review your application. We require three letters of recommendation for our PASS application. If you wish to send in more than three, you will need to submit any additional via mail. If not, the three letters in PASS will work. If you get an email from Jessica Lopez that your application has been received, but is not yet complete, this is most likely due to the fact that your recommenders have not yet turned in their letters for your PASS application.